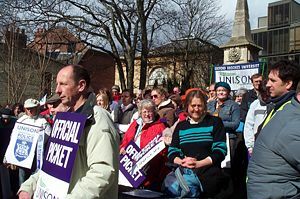 A rally of the trade union UNISON in Oxford during a strike in 2006. A labor union, or trade union, is an association of fair wage-earners uniting for the purpose of maintaining and improving the conditions of their employment. Over a three-hundred-year period, labor unions have developed into a number of forms, influenced by various political and economic regimes. Immediate objectives and activities of trade unions often vary according to industry. Despite such differences, however, the fundamental ideals upheld by traditional labor unions include the provision of member benefits, the right to collectively bargain, and the right to take industrial action. Early trade unions, like Friendly Societies, provided a range of benefits to accommodate their members in times of unemployment, ill health, old age, and death, many of which have subsequently been assumed by the state. Union members are also protected when taking industrial action, such as striking to achieve particular goals. Unions often promote political legislation favorable to the interests of their members or workers as a whole. Thus, provided cooperative relationships are maintained between management and labor unions, their work is generally beneficial to society, ensuring that workers are well-cared for and thus able to make their best contribution to society as a whole. In the eighteenth century, much of Western society witnessed the world’s first Industrial Revolution and the abandonment of an agrarian culture with craft based production. The young industrial environment provided much of the momentum for the establishment and advancement of the labor union. The start of the Industrial Revolution sparked a rising fear in the craft associations of the time, who feared encroachment on their established jobs, wage changes, and workforce restructuring. The rapid expansion of the industrial society quickly drew large numbers of women, children, rural workers, and immigrants into the work force to labor for meager wages in appalling conditions. These working environments would later prove to be an important arena for change. Trade unions have sometimes been seen as successors to the guilds of medieval Europe, though the relationship between the two is disputed. Medieval guilds existed to enhance their members’ livelihoods, through controlling the instructional capital of artisanship, and the progression of their members from apprentice to craftsman, journeyman, and eventually to master and grandmaster of their craft. Guilds also facilitated mobility by providing accommodation for their members traveling in search of work. Though guilds exhibited some aspects of the modern trade union, they also exhibited aspects of modern professional associations and corporations. Unlike modern labor unions, guilds were highly selective and offered membership to only those artisans practicing a specific trade. Labor unions seek to incorporate a broad array of laborers, to increase membership numbers and union leverage as a whole. Since the 1894 publication of Sidney and Beatrice Webb’s History of Trade Unionism, trade unions have been defined as a collection of employees working to negotiate pay rates, working conditions, and member benefits. Others, however, have put forth the view that trade unions are part of a broader movement to benefit society, to be conceived of along the lines of freemasons, friendly societies, and various fraternal organizations. In the eighteenth century, most countries deemed labor unions illegal, and constructed severe penalties, including execution, for the attempt to organize such affiliations. Despite these measures, labor unions succeeded in forming, and acquired political powers resulting in the passage of legislation which legalized organizing efforts. Despite the awarding of legal stature, trade unions continued to face generations of opposition. The right to join a trade union is contained within the Universal Declaration of Human Rights in Article 23, subsection 4. This clause states that “Everyone has the right to form and to join trade unions for the protection of his interests” (1948). This article also prohibits the forcing of a person to join or form such a union body. The forcing of an individual to enter into a union, whether by a government or a business, is generally considered a human rights abuse. Similar allegations can be leveled against any employer found to be discriminating against employees based on union membership. Throughout nineteenth-century continental Europe, socialist parties and anarchists played a prominent role in the formation and progress of trade unions. In Britain, New Model Unions dominated the union movement. There, trade unionism would remain stronger than the political labor movement until the early years of the twentieth century, which marked the formation and growth of England’s Labour Party. There are three major structures of union organizing: craft unionism, general unionism, and industrial unionism. Craft unionism is defined by the organization of a particular section of skilled workers. An organization of a cross-section of workers from various trades is known as general unionism. Attempting to organize all workers within a particular industry is defined as industrial unionism. Labor unions are often divided into branches, or locals, and are united through national federations. These federations are affiliated with international organizations, such as the International Confederation of Free Trade Unions. In many countries, a union may acquire the status of a legal entity and obtain a mandate to negotiate with employers for the workers it represents. In such cases, unions are awarded certain legal entitlements that allow them the right to collectively bargain with employers regarding member wages, working hours, and other conditions of employment. The inability of both parties to reach an agreement may lead to industrial action, a right granted to all recognized unions. In other circumstances, unions may be denied the right to represent workers, or the right may be infringed. This lack of status may result if unions fail to be officially recognized, or if the political or criminal prosecution of union activists and members is undertaken. Union functions are also delineated by a service model and an organizing model. The service model maintains worker rights, provides member services, and resolves union disputes. The organizing model typically involves full-time organizers, who foster confidence, build networks, and promote leaders throughout the workforce. Labor organizers may also launch confrontational campaigns involving large numbers of union members and affiliates. Most labor unions are a blend of these two philosophies. Union leadership is usually achieved through democratic elections. Companies that employ workers with a union generally operate on one of several models called shops. Within the United States, unions can operate under a closed shop or a union shop. Under a closed shop, a union will employ only those who are already union members, and employers must recruit directly from a union pool of applicants. A union shop employs non-unions workers as well, but establishes a time limit within which new hires must become union members. An agency shop requires non-union workers to pay a fee to the union for its services in negotiating their contracts. This is sometimes referred to as the Rand formula. In certain situations regarding U.S. government employees, fair share laws make it easy to require these sorts of payments. An open shop is a union operation that does not discriminate based on union membership. Where a union is active, an open shop will allow for workers to benefit from, but not contribute to, the labor union. In the United States, "Right to Work" laws mandate the operation of an open shop on the state level. During the 1980s, under Prime Minister Margaret Thatcher, the United Kingdom was introduced to a series of laws directing the government to restrict all closed and union shops. All agreements requiring a worker to join a union have since been deemed illegal. In 1947, the Taft-Hartley Act outlawed the operation of the closed shop union in the United States, but permitted the existence of the union shop. Unions may also engage in broader political or social struggles. Social unionism defines the many unions that use their organizational strength to advocate for social policies and legislation considered favorable for their members. In some countries, unions maintain close alliances with political parties. In many countries, labor unions may be closely linked to, or may even share leadership with, a political party intended to represent the interests of the working class. Often times, these parties include left-wing politicians or socialists. In the United States, labor unions have historically aligned with the Democratic Party, though their allegiance to the party is by no means steadfast. On a number of occasions, the Teamsters Union opted to support Republican candidates. In 1980, the Professional Air Traffic Controllers Organization (PATCO) endorsed presidential candidate Ronald Reagan, only to be later disassembled by Reagan’s installation of permanent replacement workers when the organization waged a strike. To avoid the alienation of its Catholic constituency, the AFL-CIO supports a pro-life Republican position and remains vocal in its opposition to abortion. In the United Kingdom, the relationship between the labor movement and the labor party has disintegrated over the party’s support of privatization plans, a position at odds with the movement’s perception of worker interest. Varying structures of employment laws can also affect a union’s business operations. In many western European countries, wages and benefits are largely set by a governmental body. The United States takes a more laissez-faire approach, setting a minimum standard but allowing most workers' wages and benefits to be decided through collective bargaining and market forces. South Korea has historically regulated collective bargaining by requiring employers to participate in bargaining practices. However, collective bargaining is only legally recognized if the sessions are held before the lunar New Year. Under totalitarian regimes, such as Nazi Germany and the Soviet Union, labor unions were typically controlled by de facto government agencies, devoted to the smooth and efficient operation of enterprises. Labor unions also engage in international operations. Such organizations include the World Confederation of Labor and the World Federation of Trade Unions. The world’s largest international organization, the Brussels-based International Confederation of Free Trade Unions, encompasses an estimated 231 affiliated organizations throughout more than 150 countries and territories, and has a combined membership of 158 million. National and regional trade unions organizing in specific industry sectors or occupational groups have also formed global union federations, such as Union Network International and the International Federation of Journalists. As labor laws remain diverse in different countries, so do the functions of unions. For example, German labor unions legally may operate only an open shop policy, and all discrimination based on union membership is forbidden. German unions also play a large role in the managerial decisions and co-determination of global unions by participating in corporate boards. The diversity of labor union operations in several countries, including Poland, South Africa, the United Kingdom and the United States, is briefly detailed below. Poland’s Independent Self-governing Trade Union or, Solidarnośc (Solidarity), is a trade union federation founded in 1980. In its earliest years, Solidarity constituted a broad anti-communist social movement that the Polish government attempted to destroy through martial law in 1981, and through a history of repression. In 1989, roundtable talks between a weakened Polish government and political opponents led to the establishment of semi-free elections. Later that year, a Solidarity-led coalition was formed and in December, union leader Lech Wałęsa was elected president. Since its 1989 inception, Solidarity has become a more traditional trade union, with relatively little impact on the Polish political scene of the early 1990s. The survival of Solidarity was an unprecedented event not only in Poland, a satellite state of the USSR ruled by a one-party communist regime, but the whole of Eastern Europe. It meant a change in the hard-line stance of the communist Polish United Workers' Party, which sought to end a 1970 protest with machine gun fire. The establishment of Poland’s Solidarity also differed from the broader Soviet communist regime, a coalition which had quelled both the 1956 Hungarian Uprising and the 1968 Prague Spring with Soviet-led invasions. The influence of Solidarity led to the intensification and spread of anti-communist ideals and movements throughout Eastern Europe, weakening a series of communist governments. A succession of peaceful anti-communist counterrevolutions in Central and Eastern Europe were sparked. Various communist-opposing groups throughout Eastern Europe followed the lead of Solidarity, eventually leading to the Eastern Bloc's effectual dismantling, and contributing to the collapse of the Soviet Union in the early 1990s. The history of South African trade unions dates back to the 1880s. At that time, unions were viewed as a reflection of national racial disunity, as the earliest unions were established only for white workers. Through the turbulent years of apartheid, trade unions played an important part in developing political and economic resistance, and were a driving force in the establishment of a South African democratic government. Trade unions continue to represent an important force in South Africa, encompassing a quarter of the general work force, represented by over 3 million members. The Congress of South African Trade Unions (COSATU) is the largest of the three major trade unions with a membership of 1.8 million. COSATU is part of the Tripartite alliance with the ruling African National Congress (ANC), and the South African Communist Party (SACP). British labor unions were often subject to severe repression until the mid-nineteenth century, but continued to exist throughout the city of London. During that period, workplace militancy often erupted, as in the 1820 rising in Scotland, where 60,000 workers attempted a general strike. In 1834, a significant attempt to set up a national labor union came in the form of Robert Owen's Grand National Consolidated Trades Union, which attracted a range of socialists and revolutionaries. However, facing severe pressures, the organization would later collapse. In the 1840s, trade unionism was overshadowed by the political activities of the British parliament, though the establishment of less radical trade unions would take hold in the 1850s. In 1860, the London Trades Council was founded, followed by the establishment of a Royal Commission on Trade Unions in 1867 and the Trades Union Congress in 1868. Three years later, legal status would be awarded to British trade unions under the 1871 Trade Union Act. During this period, the strongest trade unions were comprised of skilled workers, and included the Amalgamated Society of Engineers. Trade unionism among unskilled workers made little progress until the emergence of the New Unions in the late 1880s. Unions played a prominent role in the creation of the Labour Representation Committee, which would effectively form the basis for Britain’s modern Labour Party. Trade union membership increased throughout years of industrial unrest and World War I, resulting in a widespread recognition of unions and an increase in management operations. United States labor unions arose amidst the nineteenth-century Industrial Revolution and have revolved around industrial advancement and the behavior of the U.S. economy. Early historical resistance by employers to members and affiliates of labor unions marked a long-established relationship of adversity, and posed a great challenge to union organizers and members. In 1869, the United States’ first national federation to appear as a successful union organization was the Noble Order of the Knights of Labor. Affiliates of the Noble Order worked to legally establish an eight-hour workday, equal pay for equal jobs, and the abolition of child labor. In 1886, members of the Noble Order numbered nearly 700,000, but the organization folded by 1900, in the face of a series of failed strikes. The American Federation of Labor was established in 1886 to promote ideals similar to those of the Noble Order, including higher wages and shorter work hours. However, in the late nineteenth century, a larger series of failed strikes would lead to an even greater set back in the legal establishment of U.S. labor unions. Employers also fought labor unions by establishing specialized employee contracts to disallow any union affiliation. In 1935, U.S. labor unions were granted legalization under the Wagner Act, an act establishing legal rights and power to union organizations under federal law. These powers included the right to collective bargaining and self-organization, and outlawed the discrimination of union members in the workplace. The Wagner Act also established the National Labor Relations Board. Labor unions in the United States now function as a legally recognized representation of workers from various industries. Recent years have seen an increase in participation among the union’s service sector and public sector. Activity by labor unions in the United States is generally focused on collective bargaining rights, employee benefits, and working conditions. Unions have also focused on the representation of their members in violations of contract provisions by employee management. American unions remain an important political factor through the mobilization of their memberships and affiliations with like-minded activist organizations. Main political agendas include immigrant rights, trade policies, health care, and living wage campaigns. Recent changes to the U.S. labor movement have included the departure of five major unions led by the Service Employees International Union from the AFL-CIO and into the Change to Win Federation. The face of the U.S. labor movement is also changing. The twentieth century showed women made up the majority of new workers, and union growth has been significantly higher among workers of color and immigrant workers than among white male workers. Some Nordic countries including Belgium, Sweden, and Finland have strong, centralized labor unions, where each industry represented has a specific union and together comprises a national union confederation. The largest Swedish union confederation is Landsorganisationen (LO), and has approximately two million members totaling more than one-fifth of Sweden's population. Finland's equivalent, the Central Organization of Finnish Trade Unions (SAK), has about one million members out of a total country population of 5.2 million. France is thought to have one of the lowest union densities within Europe, encompassing an estimated 10 percent of workers. Several unions can be represented inside large companies or administrations, with one from each of the main national confederation of unions. Union membership tends to be concentrated in specific areas, including the public sector. Australia’s labor movement has a long history of craft, trade, and industrial unionism. As of 2005, however, union numbers have declined due in part to the actions of Australian politicians and the effects of liberal governments, which introduced the 1996 Workplace Relations Act. Union movements worldwide have considerably improved working conditions for migrant workers. In the United States, united farm workers led successful boycotts and strikes against grower employers, including wine-grape growers. Labor unions have also been particularly important for vulnerable populations and individuals most likely to suffer from labor-market discrimination. The labor movement is credited with bringing an end to practices of child labor, improving worker safety, and increasing employee wages. These organizations are also believed to have raised the social standards of living by reducing the number of hours in a workweek and establishing public education for children. The Polish Solidarity, making perhaps the largest historical contribution, is often credited with the downfall of Eastern European communism. Worldwide, labor unions pride themselves with the protection and advancement of the working middle class, and the crafting of political practices. Labor unions are more effective in periods of labor shortages and economic growth. Labor unions have been shown to suffer throughout times of national economic instability, with increases in unemployment, lower wages, and deteriorated living conditions. Unions have also faced international hardships at the hands of globalization and industrial progression. Scarcities of well-paying manufacturing jobs and the minimization of assembly lines have lessened the abilities of labor unions to significantly impact the labor market, leaving members more concerned about job security than higher wages. Thus, unions have come to seek a greater cooperation in labor management to regain the power to allocate jobs within the labor market. Encyclopedia Britannica. 2006. “Universal Declaration of Human Rights.” Encyclopædia Britannica. Legal Encyclopedia. 2006. “Labor Union.” Encyclopedia of American Law. Gale Group. Pope John Paul II. Sollicitudo Rei Socialis. Vatican Website. Colin Barker, "The Rise of Solidarnosc," International Socialism, Issue 108. This page was last modified on 17 June 2018, at 21:26.